The British army captured Jerusalem from the Turks in December 1917 and continued their Palestine campaign for another year until the capture of Damascus. 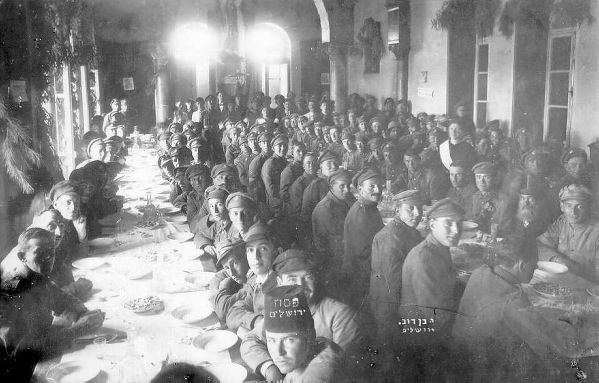 Meanwhile, the Jewish Legion, consisting of Jewish volunteers, sat in Cairo chafing at the bit to join the fight in Palestine. They finally joined Allenby's forces in June 1918 and fought against the Turks in the Jordan River Valley. served as a photographer in Jerusalem. Ben-Dov filmed Allenby's entry into Jerusalem in 1917. 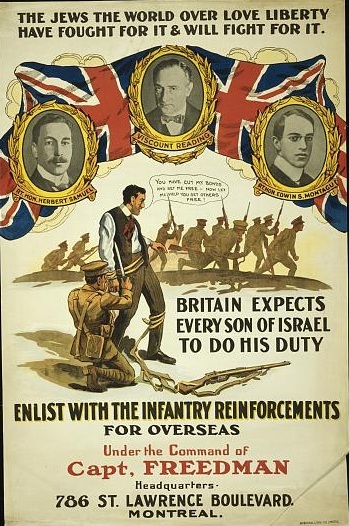 "The Jewish Legion was the name for five battalions of Jewish volunteers established as the British Army's 38th through 42nd (Service) Battalions of the Royal Fusiliers. 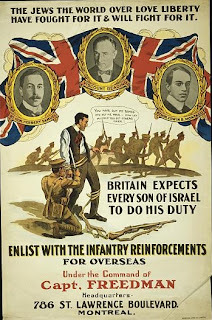 The initial unit, known as the Zion Mule Corps, was formed in 1914-1915 during World War I, when Britain was at war against the Ottoman Turks, as Zionists around the world saw an opportunity to promote the idea of a Jewish National Homeland." Jerusalem 5678" which corresponds to 1917-1918. The photograph of the soldiers sitting in Jerusalem is something of a mystery. It is dated 1918, but the Jewish Legion was still based in Cairo in the spring of 1918. Examining the head gear of the soldiers suggests the group consisted of Jewish fighters from various units -- British, Australian cavalry, and Scottish -- who assembled to participate in the Passover seder in Jerusalem prior to the Jewish Legion arriving in Palestine. More information on the Jewish Legion is available in We Are Coming, Unafraid: The Jewish Legions and the Promised Land in the First World War by Dr. Michael Keren, professor of Political Science, and Dr. Shlomit Keren, professor of History and Israel Studies, at the University of Calgary. They present personal diaries, letters and memoirs of soldiers who fought in the Jewish Legions. "In the First World War, many small nationalities joined the war in order to ensure self-determination when it was over. This was also the case with the Jewish battalions,” writes Shlomit Keren. Indeed, the Jewish Legion ignited the spirit for the Jewish self-defense forces in Palestine that evolved eventually into the Israel Defense Forces. Read more about Colonel Patterson and the Jewish Legion at The Seven Lives of Colonel Patterson: How an Irish Lion Hunter Led the Jewish Legion to Victory. As Jabotinsky notes in his The Story of the Jewish Legion (Ackerman 1945), p. 130, "after a month on the Shechem front and two weeks' rest, we were sent to the Jordan Valley. It was the middle of August 1918". A more precise dating of the first operational military action of his battalion is that on July 7, 1918, he writes to his wife from Jerusalem but on July 9, the letter is from Abuein (a village west of Sinjil, which is west of Shiloh). On July 22, he writes his wife that he is leaving for Jerusalem to participate in the foundation stone-laying of the Hebrew University and from there to Cairo to deal with the rest of the Legionaires. On August 7, his letter home is again dated Jerusalem. On Aigust 22, the next letter is from Bir Salaam.